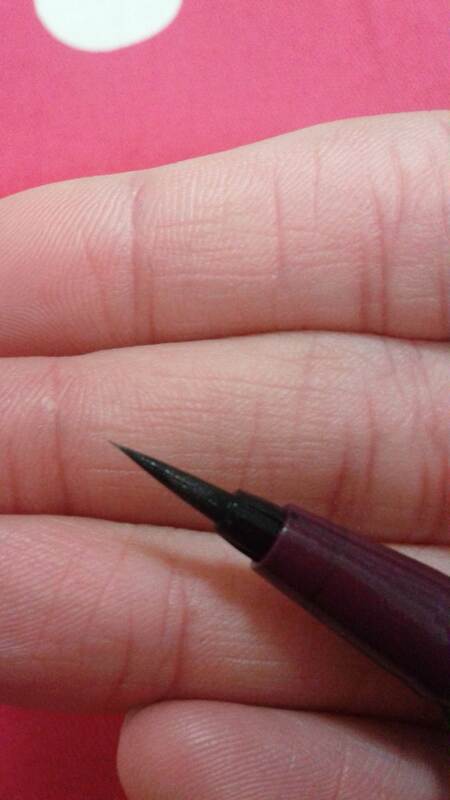 After tackling false eyelashes, I’m taking on eyeliner. 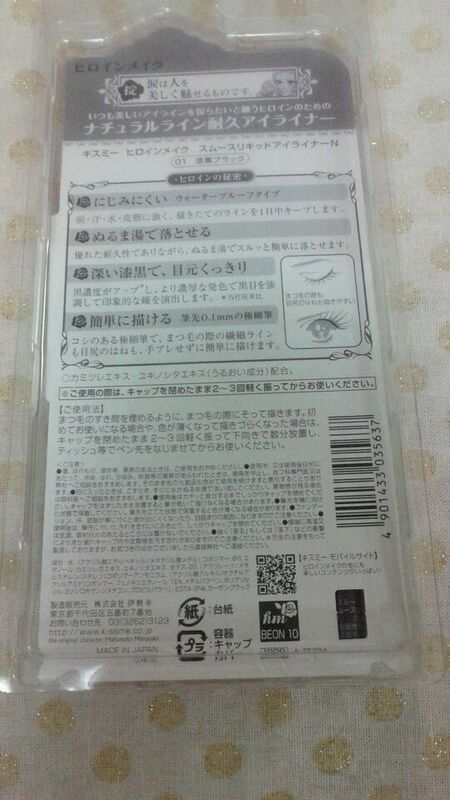 Japanese women have high standards for makeup products. They don’t mind spending money on looking beautiful, as long as they’re getting great quality for it – no different than any other women, perhaps. I had never really dabbled with liquid eyeliner before coming to Japan. The first one I ever bought and fell in love with was an Integrate by Shiseido one, and I haven’t looked back since, especially after my disaster with Rimmel London Scandaleyes Thick & Thin Eyeliner over the summer, which I ranted about here. 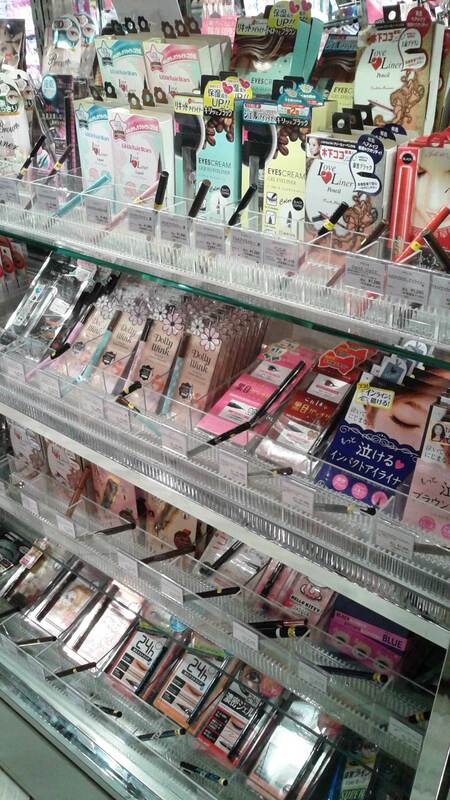 Whether you’re in a drugstore, in Donki, or in LOFT, I don’t think it’s possible to go wrong. 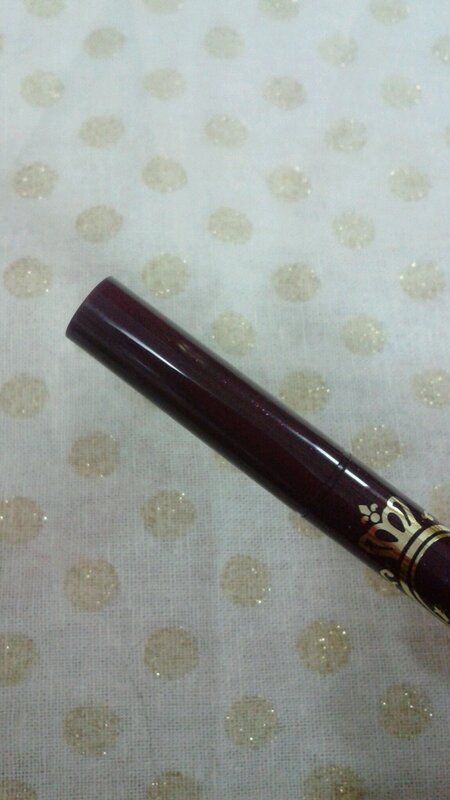 I’m currently using a gorgeous one by Kiss Me Heroine Make. 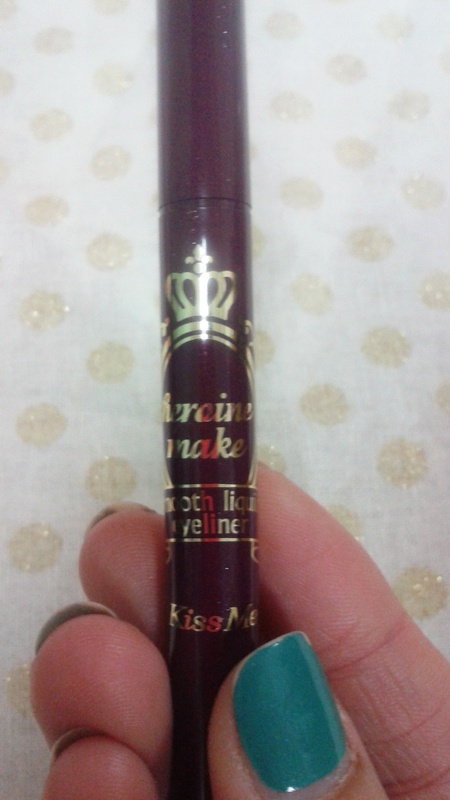 The cute, pretty, princess packaging gets me every time, and once you’ve opened it, you’re left with a beautiful iridescent glittery aubergine purple eyeliner pen embossed with the product name. It might not appeal to you, but I love it! (Maybe because I’m super girly? Or maybe because I have a soft spot for manga-style packaging? Who knows?) I also find it to be a very good quality, affordable drugstore mascara. In two words, I approve! 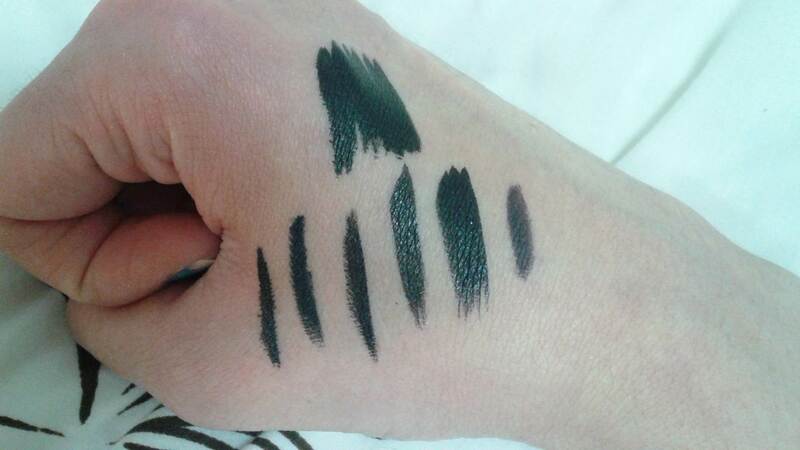 The brushes on all liners I have swatched on the back of my hand have given a smooth, thin line on application, and the liner stays put, especially when it’s waterproof, when it stays a little too put for my liking. 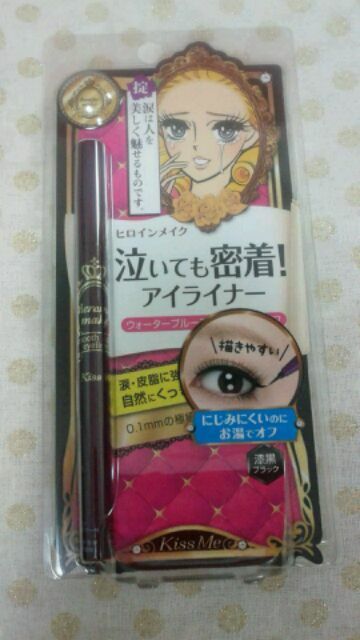 Some popular brands include the aforementioned Heroine Make by Kiss Me, Oscar Impact & Cool Eye by Creer Beaute (whose packaging features the main characters from popular Japanese manga and anime La Rose de Versailles), K-Palette’s 1 Day Tattoo liner, Dolly Wink, Integrate by Shiseido, Majolica Majorca also by Shiseido, Kate, Lavshuca by Kanebo, and of course Shiseido and Shu Uemura have products to offer as well, so you’re really spoilt for choice here. 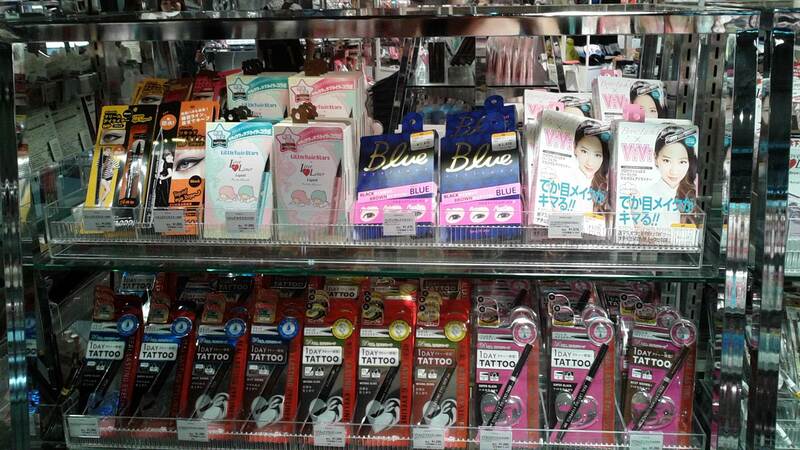 If you get the chance to try some Made in Japan eyeliner without breaking the bank, I’d say go for it! Hope you’re all having a beautiful day, darlings! A variety of swatches from the selection at LOFT, Shibuya. The packaging that melts my heart. Look like a manga heroine? Yes please! I tried to capture the gorgeous sparkle – in vain I fear. See the thin, precise line? Lovely! Holy eye makeup!!! =) SO much to choose from. I like the liner you chose! I know, right? How on earth does one decide? I’m stucked with Tsu-chan’s Dolly wink eyeliner! 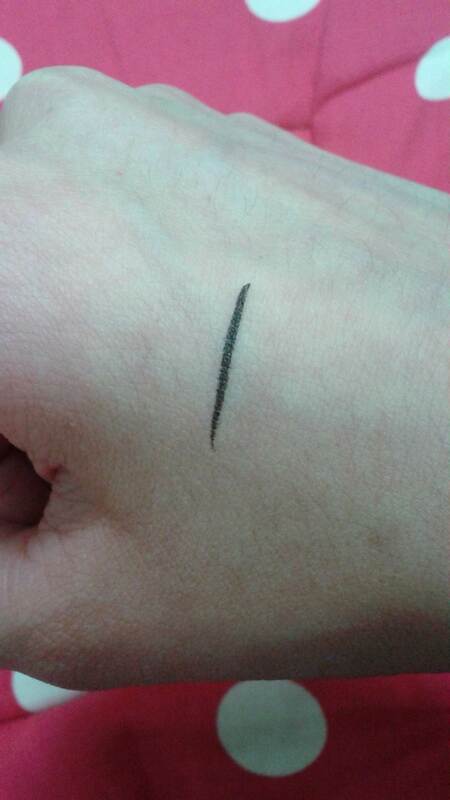 I’m looking for the diamond beauty eyeliner in brown, but you are right, it’s difficult to get a bad make up product even if you are looking in the cheapest drugstore brands. Well once i bought a kiss me heroine make tsukemas and I was a bad idea. But overall, japanese make up is amazing! I agree 🙂 Dolly Wink is SO popular! Here in Romania we have just a 3 or 4 brands to pick up one, and a few made in China.